His red pen and marked-up copy stood out as he and fellow protester Mike McGetrick reached the sixth floor of a steely high-rise in Anaheim. Their message for Assemblyman Tom Daly, an Anaheim Democrat, was simple: “I’m just gonna go with this,” Lauten said, unfolding his statement. “I’m gonna tell him to say no,” McGetrick said. With only one working month left in session, California legislators will likely consider a bill that would eliminate most religious exemptions from Title IX requirements for colleges and universities that receive public funds. Title IX is a federal policy designed to combat gender discrimination in colleges and universities, and SB1146 would, among other things, require housing and restroom accommodations that adhere to the student’s gender identity. Lauten, McGetrick and others split into groups to target five Southern California assemblymen last week to urge a “no” vote. Some groups came with more posters, cameras and statements for the media than the Anaheim protesters, but all were ready to discuss their concerns. Opponents argue the bill would restrict their First Amendment protections, while supporters say current and prospective LGBT students are discriminated against by religious colleges, especially after federal recommendations that Title IX should include transgender students. “This is about putting outrageous pressure on schools, opening them up to interminable liabilities, and at its core, making it easy for people to deprive these schools of the opportunity to operate by and to pursue the core principles they’ve laid out,” said Arthur Schaper, the director of California MassResistance, a group that aims to limit the LGBT movement and organized the protests. But does it fight discrimination? SB1146, sponsored by Sen. Ricardo Lara, D-Bell Gardens, would allow only colleges that prepare students for religious vocations to apply for a Title IX exemption, a special waiver that allows colleges to make admissions and hiring decisions based on their religious beliefs about sexuality. The bill would also require that colleges make public their Title IX exemptions. Current law exempts religious institutions from both federal and state laws if they believe Title IX requirements are not consistent with their religious beliefs. “All students deserve to feel safe in institutions of higher education, regardless of whether they are public or private,” Lara said in a statement in April. 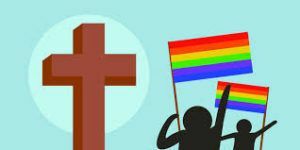 “California has established strong protections for the LGBTQ community and private universities should not be able to use faith as an excuse to discriminate and avoid complying with state laws. No university should have a license to discriminate.” Lara did not respond to CalWatchdog’s requests for comment. Besides Daly’s office, California MassResistance activists visited district offices of four other Assembly Democrats: Ian Calderon of Whittier, Miguel Santiago of Los Angeles, Patrick O’Donnell of Long Beach and Chris Holden of Pasadena. At least 42 California institutions qualify for the exemption. And of the nine that have submitted applications, seven have been granted and two are pending, according to the U.S. Department of Education. Exemptions are usually granted, though the college must specify the areas to which their application applies, such as in housing, athletics, facilities or admission by gender identity. Though Title IX exemptions have been around since the federal Higher Education Act was amended in 1972, exemption requests have soared in the last few years since protections were expanded to include transgender students. According to the Human Rights Campaign, two schools requested exemptions between 2009 and 2013. In 2014 and 2015, there were at least 56. The Supreme Court has ruled on the limits of religious freedom at universities before. Perhaps the most well-known ruling was against Bob Jones University in South Carolina. Bob Jones University did not admit black students until 1971, but barred interracial dating and marriages among students after that. In 1976, the university lost its tax exempt status based on IRS regulations against racially discriminatory admissions policies. The Supreme Court upheld the IRS’ decision to withhold tax exempt status in 1983. Instead of changing its interracial dating policy, the university chose to keep it intact and pay years of back taxes. Schaper is also concerned about the bill’s requirement that makes Title IX exemptions public. Colleges would be required to advertise their Title IX exemption status on admission materials, in student orientations and in a prominent place on campus. “This puts an undue burden on colleges and makes them vulnerable to lawsuits,” Schaper said. An LGBT activist group at Biola University in La Mirada is pushing against religious colleges from the other side of Title IX. In May, Erin Green, the executive director of Biolans’ Equal Ground — a group of Christian, affirming LGBTQ students and supporters — wrote a letter to the college asking it withdraw its pending Title IX exemption request. But Biola opposes SB1146 and it doesn’t appear institutional leaders will withdraw the college’s exemption request. SB1146 already passed the Senate and faces a floor vote in the Assembly. If it passes, the bill will reach Gov. Jerry Brown’s desk later this year. Brown has been supportive of pro-transgender and LGBT legislation, most recently signing the “Lesbian, Gay, Bisexual, and Transgender Disparities Reduction Act” in 2015.